Located on the west coast of Kalaallit Nunaat (or Greenland), 250 km north of the Arctic Circle, Ilulissat Icefjord is the sea mouth of Sermeq Kujalleq, one of the few glaciers through which the Greenland ice cap reaches the sea. Sermeq Kujalleq is with about 20 m per day one of the fastest and most active glaciers in the world. Its annual calving is of over 35 km3 of ice, 10% of the production of all Greenland calf ice and more than any other glacier outside Antarctica. And probably it was one of the giant Sermeq Kujalleq icebergs that sank the Titanic. The combination of a huge ice-sheet and the dramatic sounds of a fast-moving glacial ice-stream calving into a fjord covered by icebergs make for a dramatic and awe-inspiring natural phenomenon. So I simply had to go there for The Freshwater Project - it’s frozen, but it’s freshwater. 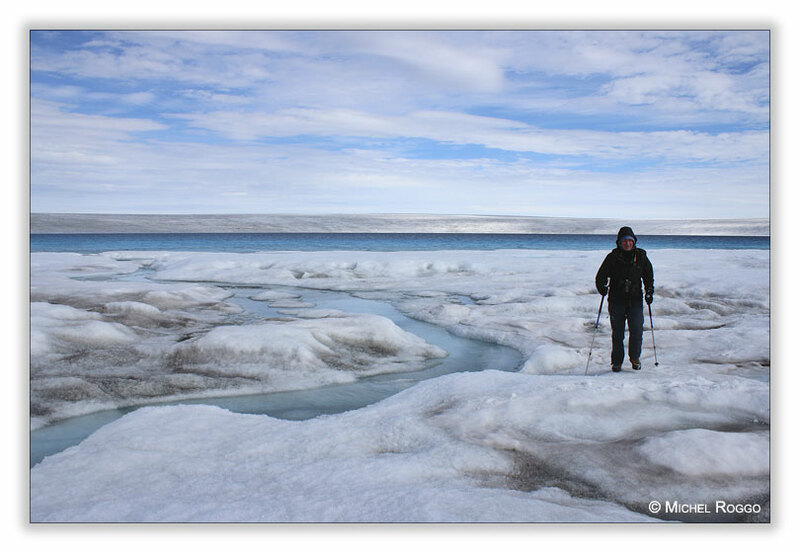 First I was working along the coastline from boats, then I went to the ice cap, high above the Sermeq Kujalleq glacier. 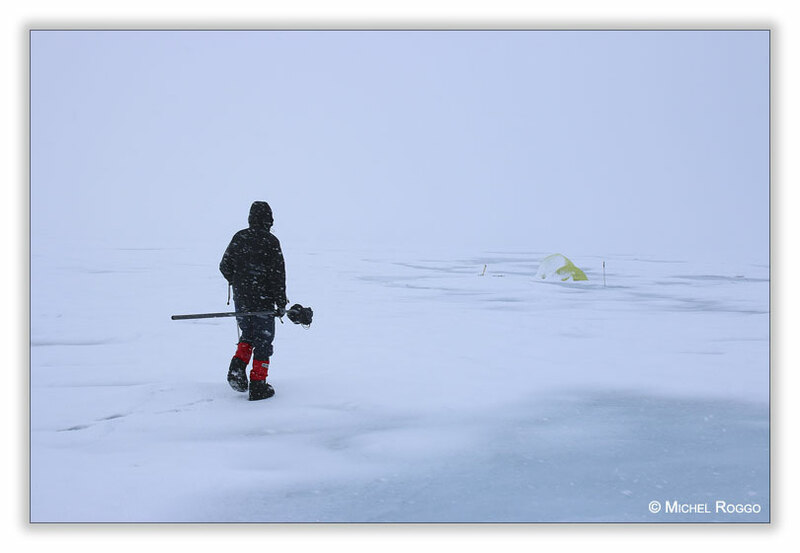 I was out for meltwater lakes and channels, to work under water as well. 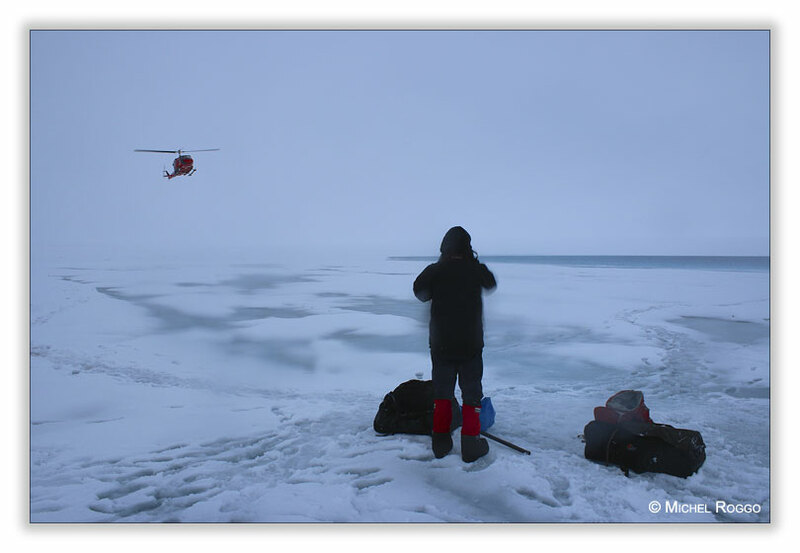 Flying with a Bell 212 helicopter, with both sliding doors open, we where looking for the right meltwater location. I decided to land near a rather big lake with clear and deep blue water. Peter Gobet, an experienced swiss mountaineer, set up our base camp on the lake shore, and the helicopter left us on this sunny beach. I started to photograph, under water as well, with some sunny breaks. Then the weather turned first into a rain storm and then a snow storm. After 16 hours of waiting in the tiny tent I could work again, in a completely different landscape. Pure white, with the blue meltwater channels and the lake. Great for landscape photography, and for underwater photography as well, with the drifting ice and snow in the channels. But to be honest - I was happy the helicopter made his way through the dense clouds up to our camp, to bring us back to the cozy hotel room in Ilulissat.